I will put technology here, while for sale items will stay in the Point Shop. Engines: 2 Large Plasma-powered engines, 4 Smaller Plasma-powered engines. Weaponry: None, but weapons can be added onto the ship. The bottom portion though is a huge super laser powered by Plasma and Nuclear fusion, able to fire down onto a planet, but it takes a long time to fire, 18 of these ships can destroy an entire planet. 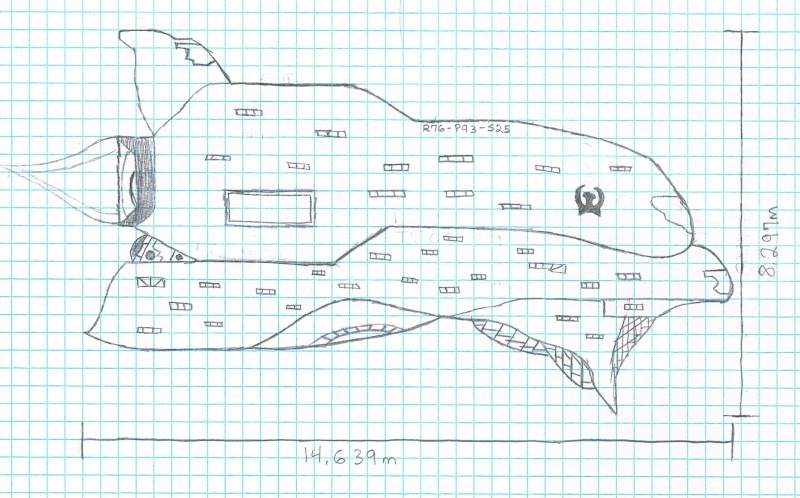 Defenses: 15meter thick outer hull with a 8meter inner hull. Immune to most ballistic weaponry and some plasma weaponry. Shields: Outer shield generator on the back of the ship, under the engines, making a shield that goes 150meters away from the ship. Notes: This ship is very expensive to build, which is why the Ieionian Legion does not have so many of these types of ships. Designed by Neyix, adopted by the Ieionian Legion of Chiyren. The Metro Class Transport Station can stay stationary, becoming a space station, it can also move in all directions. The ship has a large hangar, able to carry a small fleet of 200 small ships(fighters), or 95 large ships(transport shuttles. supply barges, etc.). The ship has 3 large windows, one on the top command deck, one on the front tip of the middle portion, and one on the lower portion. This ship can hold more than 3 million people in it, but it stays at a maximum of 1.7million. Author's Note: This ship actually took about a day to think up, and three days to actually perfect it. I drew weapons on it when I first drew it, but Jandroy should be in charge of weapon placement for this ship. I decided on putting OmegaCorp as an ally, since Sigma's characters helped Neyix in the roleplays so much. I got the idea for the look of it by looking at the Space Shuttle Endeavor, and adding a "spire" type of object on the front of the ship from Wall-E. When the ship lands, it hooks into this platform in the ground like a lock with the spire end. I may change the symbol on the front of the ship, it's suppose to be the Ieionian Legion's logo, but it may change, maybe not. I haz feelings this be the RP ship. lulz. It's obviously the Great Fox's and Samus Aran's Ship's technological love child.